Blockchain has become a big buzz word for businesses looking to transform certain industries. Although J.P. Morgan’s Jamie Dimon gained notoriety for bashing Bitcoin as a fraud, that apparently hasn’t stopped him or his company from launching the JPM Coin. If an extremely conservative industry like banking is looking for change, why not something a little more interesting like the art industry? Within this space, a small start-up called monart, is looking to radically transform the way art is brought to the market. According to the Art Market 2018 report, the global art market reached a total value of $63.7 billion two years ago. The report showed a 12% increase in sales with China rising above UK as the world’s second largest market. While staggering, these figures don’t account for off the book transactions. So, the total size of the market is actually slightly understated. Additionally, while much of the global population has a general appreciation for art, many simply lack the means or know how to participate in these dealings. And that’s where monart comes in. Monart is essentially both an art community and a marketplace. The company aims to transform the overall experience in an effort to provide innovative art discovery for the art community. Community participants will include artists, art lovers and enthusiasts, and sophisticated collectors. Artists will be provided with significant international promotion. This promotion includes online, offline and new art experiences showcasing specific creations that combine VR exhibitions, AR, 3D studio tours, and much more. At the same time, monart dedicates time and research into providing creative business models for the marketplace. These models allow for traditional purchase and sale agreements but also allow for participants to purchase shares of artwork and/or collections of art. There are essentially two huge opportunities for monart that truly set it apart from other market entrants. The first is the company’s global reach. Monart already runs a very large (more than 2,000 m2) art space in Beijing and plans to open additional offices in Paris and New York. Earlier, we established that China had become a larger art market than the UK. And I fully expect China to continue climbing higher and higher. The company’s premier art space in Beijing will allow it to gain traction with all the talented artists in China as well as the ever-growing art collecting community that are blessed with significant spending capital. Paris and New York are known to have some of the best art museums in the world so, it certainly makes sense to be in the middle of all that action. In addition to global reach, a second huge opportunity is that monart will reach people that love art but simply lack the means or resources to purchase valuable art. 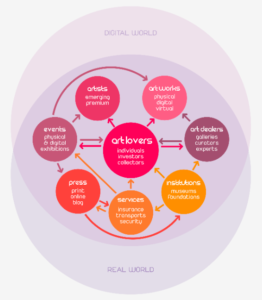 Through a dedicated Ethereum based DApp, art lovers will be able to purchase shares of artwork and/or shares of art collections. To my mind, this is an absolute game changer that opens this space up to so many. The 2017 global art industry total valuation of $63.7 billion could end up soaring in the future if these new participants enter the market. MVP is the company’s beta test site, which is expected to open imminently. The initial period will be available by invitation only. Soon after, the site will be made available to the general public. Although I have come across several promising projects during my research over the last few months, monart strikes me as both promising and fun. For many, art is something they are passionate about. For others, art represents a fantastic niche space to generate investment returns. Combine the two, along with a company with the potential to transform the industry, and you have a big winner.